Why Do German Shepherds Have a Sloping Back? The German shepherd is a dog breed that has undergone several transformations in the past years. Many people may remember that the German shepherds of decades ago looked quite different than the ones we see today, especially those shown in the show ring. One trait of this breed that has become quite popular is a sloping back, a trait that seems to have been exaggerated, up to a point that many people wonder whether it’s a good thing for the breed or not. In today’s trivia we will discover why this breed has a sloped back. 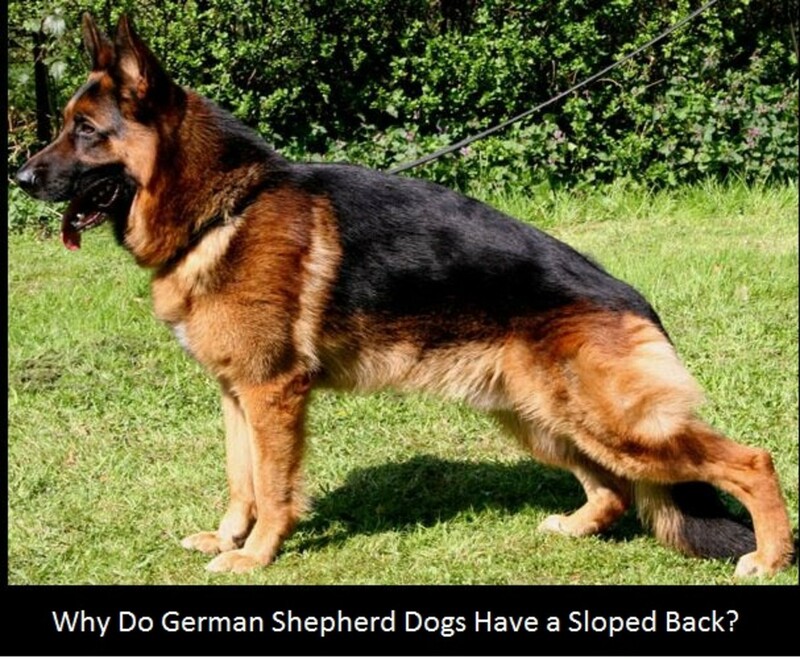 So why do German shepherds have a sloped back? The correct answer is: drum roll please…. The correct answer is B, the sloped back feature was introduced from influential breed authorities. German dog breeder, Max von Stephanitz is credited as being “the father” of the German shepherd breed. Von Stephanitz was fond of dogs with a wolfish appearance and sharp senses and worked hard in creating a working dog that could have been potentially used for herding and protecting sheep throughout Germany. While back in time, German shepherds were mostly used for work, nowadays, a great part are used as companions and protectors of the home and farm. Sure, there are several others still used for work, and the working line specimens must (hopefully, so!) have a body built for endurance and an effortless gait and one would imagine a level, non-roached back should be part of the package. On the other hand, showing lines of German shepherds mostly used for the show ring and breeding, are often the ones that stray away from the necessary characteristics needed for being a successful working dog. The breed’s conformation therefore shifted from a rectangular shape to sloped with an exaggerated hind leg angulation, features that would perhaps make Von Stephanitz roll over in the grave. But how did it all start? According to Louis Donald, a working dog judge, the curved spine seen in German shepherds dogs is fruit of a ”very small number of very influential people” that go by the name of “breed authorities” who promoted this feature at dog shows. Why did they promote this feature? There is really no reason other than it came “with the package” and since these features gained them several wins at dog shows, they soon became the norm since breeders started breeding based on the looks of dogs who won the most, causing the breed to evolve accordingly. Just recently, three-year-old Cruaghaire Catoria, a German shepherd bred by Susan Cuthbert, won Crufts Best of Breed 2016 and there were several complaints about the dog’s heavily sloping back and associated struggle to walk. The Royal Society for the Prevention of Cruelty to Animals, RSPCA claimed to be “shocked and appalled” and asked the Kennel Club to “take urgent action” to better protect animals’ welfare, says an article for The Telegraph. The video can be watched in the Telagraph’s article. A sloped back can affect a great deal when it comes to orthopedics and therefore it can have an overall effect on a dog’s health. With the back curved, the dog’s hip and knee come closer to the ground causing the dog’s hindquarters to become more angulated (the bent legs in German shepherds, people describe). These dogs often shuffle when they walk and after years of wear and tear they may become prone to serious complications that can negatively affect their quality of life. Below are some quotes coming from veterinarians about the impact of a German shepherd’s sloped back.